A nurse from the Kerala region of India writes a brief account of the conditions that nurses in India work in, which give an insight into why nurses across India are starting to organise and fight back. The following report has been written by Mr X, a nurse from the Kerala region of India. He read the following blog post on LibCom about striking nurses, and kindly agreed to write about his experience. "Through this article I would like to bring to your notice the plight of Indian nurses. I am a staff nurse in Kerala, which is a state province of India. At present, I am working in Tripura, which is in the East part of India. I have worked in four hospitals in three years after completing my training. The first was in Secundrabab, the second in Patna, the third in Vishakapatanam, and the fourth in Kolkata. I left the other hospital I worked at because of harassment. The situation is worse in Kerala, which is known as the granary of nurses, in comparison to other states. 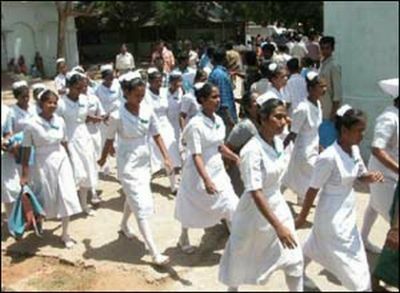 In India, 80% of nurses are from Kerala and most of them are working in the private sector. For anyone wanting to become a nurse in India, his or her fate is almost decided. The plight starts from his or her studying period. They are compelled to do every-day work in hospitals, more than just nursing work. They even do the work of housekeepers. Almost 90% of nurses come from poor families and are completing their nursing courses with the help of bank loans. The expense for completing a nursing degree is approximately 700,000 Indian Rupee’s. After completing the four year course the students are supposed to give one year work to the hospital where they had studied, without being paid. They hospitals can take your original certificates. If a nurse wanted to break that agreement they would have to pay 5,000 Rupee’s. If you complete the one year agreed, they maybe start to pay a meagre amount of 2,500 Rupee’s. From that, they would deduct between 1,500 and 2,000 Rupee’s as hostel fee’s, and for food. There are no laws to protect nurses in India, and as yet the nurses are not properly united. The duty hours are 12hrs and may exceed 15hrs according to the situation. No extra money is paid for extra hours worked, and the nurse to patient ratio in an intensive care unit is one nurse to six patients. There would be a minimum of two or three ventilated patients. They do not provide any extra holidays or other allowances. The management treat their nurses as slaves. Whilst I was working in Vishkapatanum, my salary was 2,000 Rupee’s. I was compelled to work ten continuous night shifts without a single day off. Also, following the last night shift, I was expected to report straight away for morning duty. In Kerala, the government say that the hospitals are supposed to pay 9,000 – 13,000 Rupee’s. However, none of the hospitals in Kerela are following this rule. (Mr X emailed me his pay slips, which confirm the figures he discussed). Solidarity with the striking Indian Nurses! Many thanks to the worker who sent us this account. I was wondering, however whether it would be better for them to use a fake name, in case their employer finds this through a search engine? Thanks a lot for this! Solidarity with Indian nurses and full support for your strike. btw. 2500 rupees corresponds to £32 or $51. Friends can you please bring the plights of indian nurses infront of the international nursing community..
there are some people working as nurses and doctor in our group. they will definitely spread a word about your situation and struggle. on the other hand we are translating our text about doctors´ struggle in hospitals in czech in 2010/2011 and writing another text about simmilar recent mobilization in slovakia (they didn´t strike but used mass letters of resignation as a weapon). it may be interest to you. good luck in your struggle! Thanks for writing this up munch, best of luck in your struggles. Is there any chance you could tell us about the massive strike planned for February 28th? How was it organised? Do you think it will be respected by workers outside of the trade unions? How have the trade unions related to the wider class on the issue of the strike? Admins (or working class self organisation): '7 lakh' = 700,000 rupees (it's Indian English) and so the article needs editing to correct this. Yeah, munch666nath, thanks a lot for this, really interesting.. its great to see workers struggling around the globe and even better to hear about it first hand.. solidarity..
All trade unions are supporting the nurses from outside.Especially the common people'support cant be ignored..
u have done a great job munch.... congrats on ur efforts.. hope this will work on the indian nurse's community in which i,m also included..